Parking: Free public parking is available in Lot 4, Lot 5, Lot 6, Jervey Meadows, Lot 10, McFadden, Lot 3A, and East Beach (MAP). 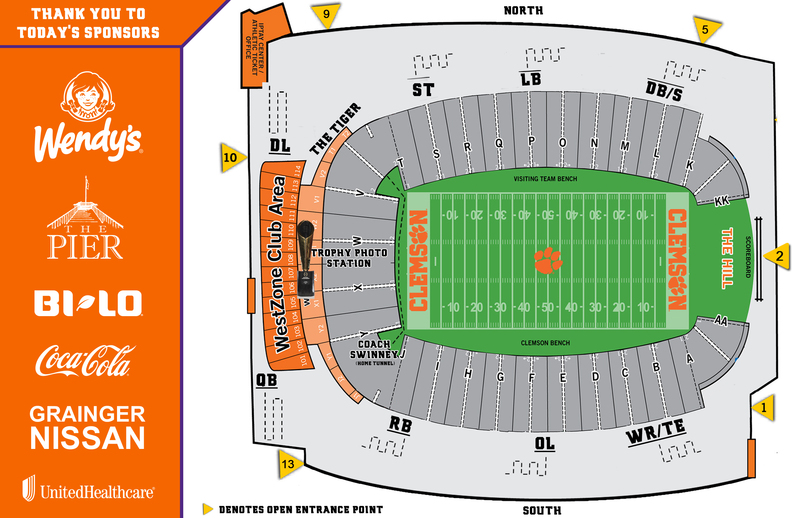 ADA parking is available with a state-issued permit at Lot C-7 (North Stadium Lot). Traffic: Ongoing construction on Walter T. Cox Blvd (Hwy 93) could impact your arrival to campus. HWY 93 from Cherry Rd. to College Ave. to remain closed on Sunday but working to allow northbound 93 to turn left onto College Ave.
*** Please limit to one item for an autograph; Per NCAA rules and regulations, student-athletes cannot be paid (or receive benefits) for their autographs or pictures. Autographed items may not be sold by or used to promote commercial entities or services. If you have any questions regarding NCAA rules, please contact Clemson University Athletic Compliance Services at cuacs@clemson.edu.